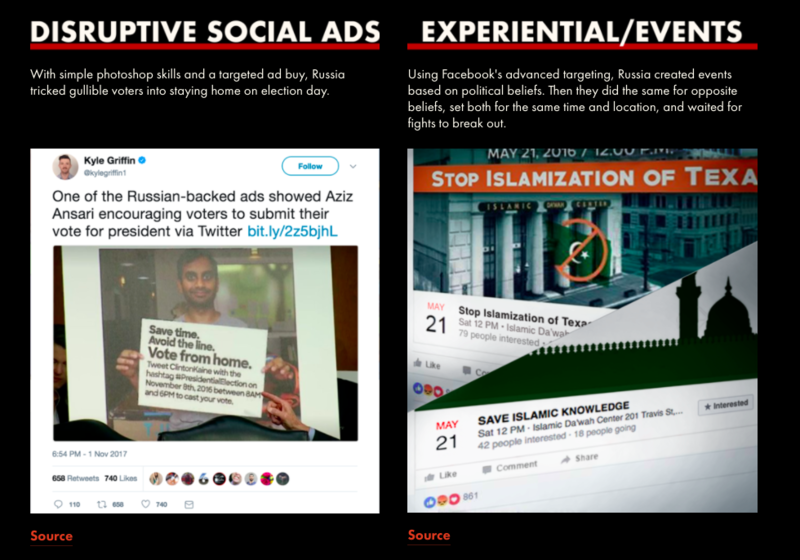 A small group of advertising industry insiders have developed a novel campaign for this years’ ad awards season — nominating Russia’s misinformation and manipulation efforts for an award. According to a report in The New Yorker, these ad insiders have already put the case study they made for Russia’s election interference — “ProjectMeddle.com” — up for a Webby Award. The Webbys is an award ceremony that purports to provide accolades and acknowledgement to “the best of the internet”. The submission video itself is something to see. Working with a team of volunteers, the advertising professionals make a compelling case for Russia’s work as a masterpiece of marketing and immoral suasion. The industry insiders use the language of marketing to call attention to the blatant manipulation of the system to disseminate Russian propaganda and misinformation. 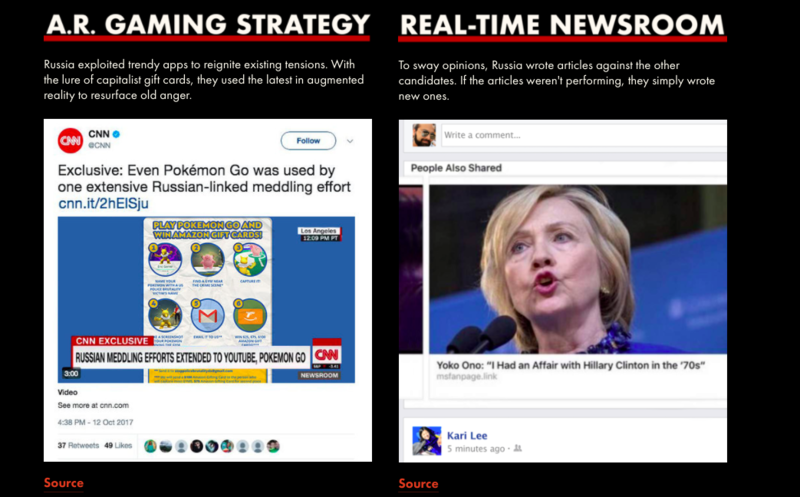 The campaign also notes that the Russian-backed campaigns tried to exploit popular apps like Pokemon Go and social media blogging platforms to create “news” to advance their agenda. It’s impossible to argue that these messages didn’t have at least some impact on the election results given the scope and reach the campaigns enjoyed. The decision to submit the campaign to awards organizations was made to confront the industry with its own hypocrisy. And ideally encourage executives to take action. “My hope is that, of all the powerful people sitting in that room, at least a few of them go, ‘What am I doing to make sure that nothing like this ever happens again?’ ”, one of the participants told The New Yorker.